In line with the upcoming Lunar New Year, Valve has recently added a new quest, dubbed as the Path of the Blossom, on the Winter 2016 Battle Pass. Much like the other three quests that were initially included on the Winter 2016 Battle Pass, the Path of the Blossom will reward users with Battle Points (500 BPs for each challenge) every time they finish a challenge. In addition, for each challenge that was accomplished, players will receive a Crimson Parcel which comes with a random gift inside. 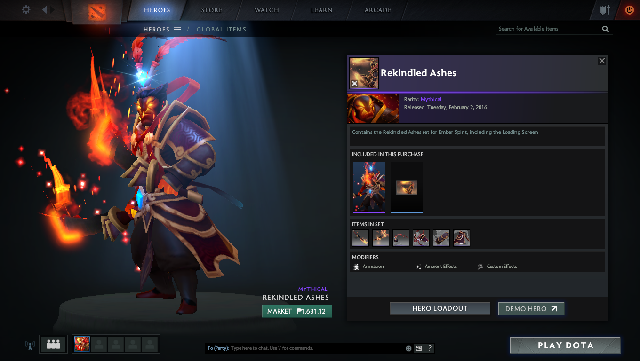 Players who have successfully finished the quest, will receive a shiny new set for Ember Spirit which is called Rekindled Ashes. However, unlike the first three quests, the new Path of the Blossom will only be available to Winter 2016 Battle Pass owners until February 15, 2016. This means that they only have 10 days to finish all of the challenges in the quest.